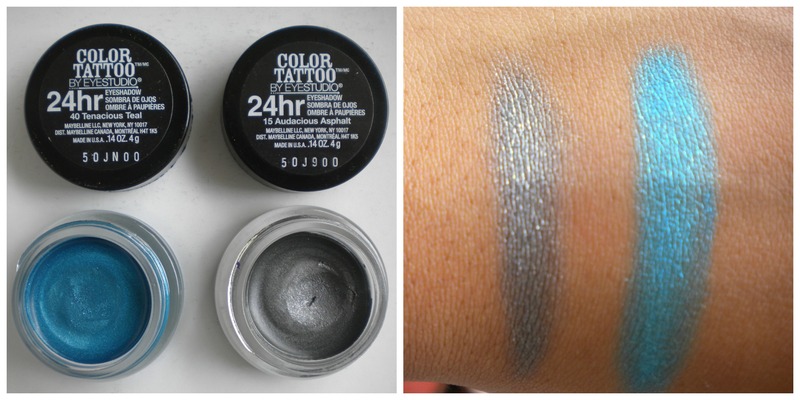 Today I’ll be reviewing the long awaited Maybelline Color Tattoo 24HR Cream Eyeshadow in “Tenacious Teal” and “Audacious Asphalt”. I have waited for so long, for it to arrive the Malaysian shore, I am so happy it did. Too bad it only came in eight (8) colors. I hope they bring in the “Metal Edition” and the “Limited Edition” soon. They are comparable and a cheaper alternative of the MAC paint pot that retails at RM72 and Make-Up Forever Cream Eyeshadow that retails at RM100.